Proud of the PJ: Unbanned! Esta noche, en UK, habra personas que dormiran peor de lo que acostumbran. I think my last post must have gone into cyberspace! Just to say how over the moon I am that Goncalo Amaral has at last seen some justice! I hope that you and the family are well. Thanks. We're fine. Hope you and yours are too. CLAUDIAAAAA :) i feel so happy that i have to share it here with you and all who fought for GA rights freedom of speech and of course justice for MADDIE. It was certainly a great day for justice, truth, freedom and democracy, all things that we have fought for in the last 36 years! Let's hope this is just the first step towards justice for a little girl left behind. Oh LOL sorry Claudia its me Hope not sure where tigs came from but I have been called worse!!!! Good wishes to Dr G A and his family. May commonsense and justice continue to prevail in Portugal! The McCanns are back in the news again (they just love being on the front pages), with a new petition to try and raise more cash from those people undiscerning enough to contribute to their dwindling fund. Could it be they are worried that the reactions of those who once believed in them wholeheartedly (i.e. 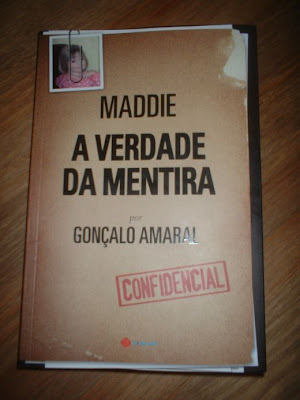 RP and her ilk) will change once Goncalo Amaral's book is published (hopefully) in the UK and elsewhere? Hope you and yours are well Claudia! I'm fine, thanks. Hope al is well with you and your loved ones too. They sound more and more desperate. The papers are all on the story of the McCann's being disappoined with Theresa May today. The Daily Mail has taken at least 70 comments. I sent a comment in asking why it is that they always print the posed 'sad' pictures of the McCanns, rather than the ones of them laughing their heads off on Maddie's 4th birthday and other ones of their jogging etc without a care in the world. I doubt it will be printed though! There is talk of the Portuguese reopening the case - if only!! Then the tapas 9 will have to get their backsides back for a reconstruction. If they don't they will make themselves look just what they are - scammers!! I still haven't got to grips with the problem with Google. Very few of them appear to be complimentary to the McCanns. AT LAST IT IS MADE CLEAR IN A UK NEWSPAPER! I think Ann Widdecombe has said what the present Home Secretary cannot say directly to the UK public. It is clear that the British Govt cannot do anything because Portugal retain PRIMACY! The McCanns should look that word up or get one of their expensive lawyers to look it up for them and explain the meaning. I wish Ann Widdecombe had mentioned that they could re-open the case by agreeing to now do an official reconstruction or KM could answer the 48 questions. Another good article from the Express. 1: The McCanns could instruct their lawyer to send a letter to the Portuguese authorities and easily get the case re-opened by now agreeing to do the official reconstruction that was previously declined by the McCanns and friends. 2: The Express have also made it clear to the UK public that the UK Govt cannot demand that Portugal do what the McCanns demand as the UK Govt have no jurisdiction. Well done! Slowly info is coming out. From the Express who paid out 550k to the McCanns! By Ann Widdecombe KATE McCann accuses Theresa May of doing too little to find her missing daughter. Her emotion is understandable but her attack on the Home Secretary is misplaced. The ball is firmly in the court of the Portuguese authorities, not the British ones. Our politicians can comment and make representations but they cannot overrule the decisions of the Portuguese, who in turn have said they will act if new evidence is produced. The Government is not, as Kate McCann puts it, giving up on Madeleine but rather is accepting its limitations over a crime that happened in another country and which is subject to another jurisdiction. Mrs May deserves credit for meeting these distressed parents, not criticism for making her own judgments about what she should then do. Hope you are well. I forgot to say Hi in the post above. It must have been the shock of reading the article! Thanks you. I'm fine, thanks. Hope you are too. Good for Anne Widdecombe, who almost always has my backing with her words of wisdom! It took a woman to pull the McCanns down a peg or two! And what a hoot she is on SCD!! Nice to read you again Zodiac!! The money grabbing, would be celebrities, are not going away. They will now release a book, not that it hasn't been on the cards since day 1, and will make millions from sales all over the world, followed by book interviews, on television and countless magazine articles. They can't lose. And all in the name of their daughter Madeleine! If they had any credibility left at all, they have now completely lost it! Shame on them! We shouldn't be at all surprised when the film rights of the book add even more to their millions! And it's no coincidence that they announce this just when Goncalo Amaral's book will be published worldwide! Yes, I'm sure you are right about that - they don't know what they are letting themselves in for. For instance, I would imagine they have to get the backing of their tapas pals before they publish. Their actions and words could bring consequences they never imagined would happen in a million years! Meantime, I wonder which newspapers around the world are lining up for the sole rights to serialisation of their 'story'! Out of the UK rags, I would imagine the Daily Mail, the Express, The Sun, Daily Mirror will be the front runners! Hopefully Goncalo will give them all the brush off when they are clamouring for the sole rights to his book! There is no contest as to which book I would rather read, and believe. PS. We are in Spain for a month's break and enjoying every minute! Hope you and yours are well Claudia. They better focus on their book on the emotional side of things and avoid details about the case because they may have a surprise if they make a mistake. One mistake will be enough. Back from holiday. presents, cards and shopping almost finished - thank goodness! Have a very happy Christmas with your family as I will with mine. And if anyone else is reading, then a very happy Christmas to you and yours too! AND MAY THE NEW YEAR 2011 BRING SOME NEW INFORMATION TO LIGHT TO GET JUSTICE FOR MADELEINE! I also have my Christmas shopping sorted out, thankfully. I've been finally listening to my mum and starting quite early on. I also wish you and yours a Very Merry Christmas and a fantastic 2011. Para ti e todos os que te são queridos, os meus votos de um Natal com saúde, paz e amor. Que o novo ano traga a realização dos teus desejos. To all bloggers i wish a MERRY CHRISTMAS AND A HAPPY NEW YEAR. Feliz Natal também para ti e para os teus e que 2011 te traga tudo o que desejas, incluindo Justiça! Please can you tell us if Goncalo Amaral will finally get his book published in English?.